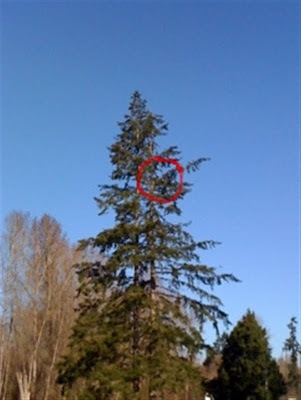 A few weeks ago I went for a walk in the morning and just happened to notice that there was an eagle sitting in a tree behind the condo complex just north of the Kenmore library. Just north of the heron rookery. I only had my cell phone camera, so the pictures aren't the best, but hopefully you can see an eagle in the middle of the picture above. When I walked closer, I was very surprised to see that there were actually two eagles in the tree, but you can't see the second one in my photo. Turns out these must have been the same ones I had just seen by the library, because a neighbor out watching them had just seen the pair arrive. But the AMAZING thing was that there were two juvenile eagles in nearby trees! Can you see that dark spot in the left side of the large cottonwood tree? And the dark spot in the cottonwood in the middle of this picture? I thought this was pretty exciting. 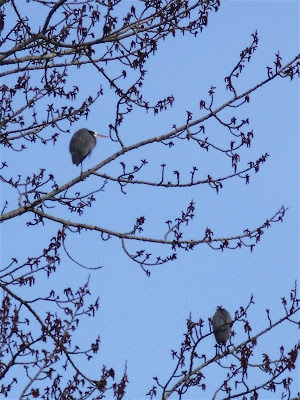 The Kenmore heron rookery isn't mentioned in the article, but I understand that the nests there have been raided by eagles, also. 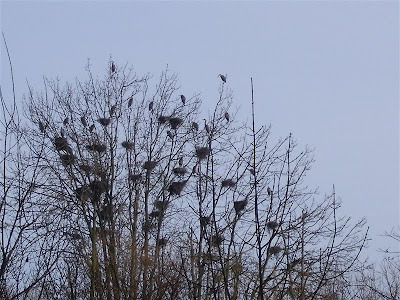 So in retrospect, I wonder what the eagles were up to down by the rookery that morning. Stream-side Planting - Phase Two - Coming Friday!